The formal unification of the Russian Orthodox Church and the Russian Orthodox Church Abroad took place in a lavish ceremony in Moscow, ending a more than 80-year rift. President Vladimir Putin has hailed the move as an “epoch-making event.” – At the end of this article, two documents: the Act of Canonical Communion and the Addendum to the Act of Canonical Communion. 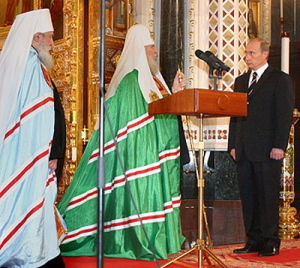 Moscow, May 16 and 17, 2007 — The signing ceremony, held in Moscow’s opulent Christ the Savior Cathedral, is being held on Ascension, the day commemorating Christ’s ascent into heaven. Moscow’s largest cathedral was blown up by Soviet dictator Josef Stalin and rebuilt after the 1991 Soviet collapse. It brings to an end a bitter division between Russia’s predominant church and the splinter church formed by exiles fleeing the Russian Revolution and the rise of the communist state. The head of the Russian Orthodox Church, Moscow Patriarch Aleksy II, and Metropolitan Lavr (Laurus), the New York-based leader of the Russian Orthodox Church Abroad, signed an agreement on restoring canonical relations. Today’s ceremony is a key achievement for the Russian Orthodox Church, which since the Soviet collapse has sought to bring the exile church back into its fold. 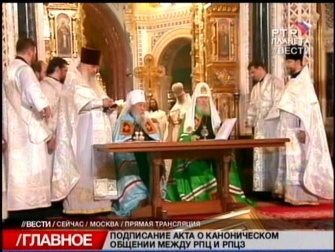 Metropolitan Lavr (left) and Moscow Patriarch Aleksy II signing the agreement. According to the document signed today, the two churches agree to recognize each other’s religious hierarchies and celebrations. The Church Abroad, however, will accept the Moscow Patriarchate as the ultimate authority. The Moscow Patriarchate will gain the right to approve the nomination of new leaders of the Church Abroad. 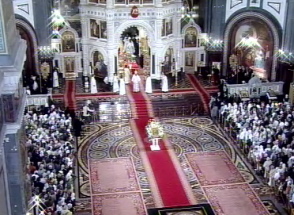 Parishes of the Church Abroad will also now mention the patriarch’s name during Liturgy. The reunification is an important step for Russia in coming to terms with its communist past. Founded by clerics who fled the 1917 Bolshevik Revolution, the breakaway Orthodox church was first based in Stavropol, a southern Russian city then controlled by the White Army. As the Red Army advanced, the church moved to Ottoman Turkey, and then to Serbia, before establishing its headquarters in New York. The Church Abroad severed all ties with Moscow in 1927 after the Moscow Patriarchate signed a declaration of loyalty to the atheist Soviet regime. Not all members of the exiled church, however, welcome the reunification. Some say the Moscow Patriarchate is stained by its Soviet past and condemn its ties with President Vladimir Putin, a former Soviet intelligence officer (see Religioscope report in 2002). Xenia Dennen, the head of the Keston Institute, a London-based group that studies religious issues in communist and former communist countries, says the reunification is significant. “It will mean a great deal for those who couldn’t receive communion from the Russian Orthodox Church Abroad,” she says. “However, there’s a lot of disagreement within the Russian Orthodox Church Abroad. There are fears that the Moscow Patriarchate’s focus is particularly on power control, on getting its hands on the property of the Russian Orthodox Church Abroad.” Under the new arrangement, the Church Abroad will retain control over its property and continue to appoint its own priests. The two hierarches and President Putin. Putin has strongly supported the reconciliation between the two churches, as well as other steps to revive Russia’s pre revolutionary past. While some have welcomed his efforts, others have accused him of stirring nationalist feelings. The Russian Orthodox Church in 2000 canonized Russia’s last tsar, Nikolai II, and his family, who were murdered by the Bolsheviks. Last year, the remains of the tsar’s mother, Empress Maria Fyodorovna, who died in exile in Denmark, were reburied in St. Petersburg.